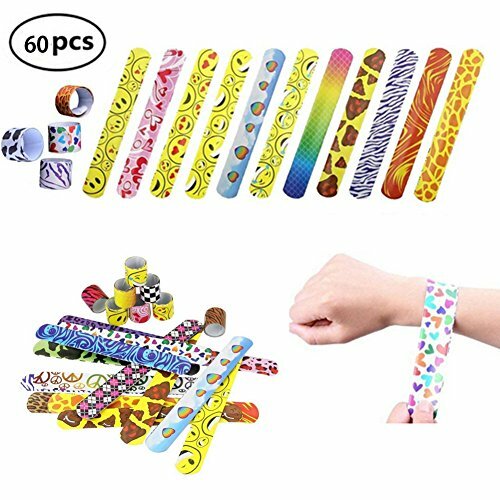 Grocery House 30pcs/60pcs Slap Bracelets Slap Bands for Kids Party Bag Fillers Snap Bands Little Toys Party Favor Pack with Colorful Hearts Perfect for School Birthday Goodie Bag (60pcs) by Grocery House at Saltarines Quito. MPN: LE11152. Hurry! Limited time offer. Offer valid only while supplies last. Description: Great for a school party goodie bag fillers. Great for boys and girls. 30 random styles of bracelets, it's enough to fun for kids. Great for a school party goodie bag fillers. 30 random styles of bracelets, it's enough to fun for kids. Easy to bent and straighten, convenient for storing. Easy and quick to take off and on. Pack of 30pcs or 60pcs slap bracelets(Optional). Patterns include emoji, hearts, peach signs, and geometric patterns and more. Stylish, fun and beautiful, snap bracelets are great for party favors, school party bag fillers, birthday giveaways, game activities prizes. Slap bracelets are durable, non-toxic, made with durable metal core inside, these bracelets are tightly wrapped with soft faux leather type material on the outside. Snap band is easy to circle your wrist with a slap. Can wear on the wrist, ankles, arms and other places. Each bracelet measures 8.5 inches/22cm, one size fits all. Suitable for over 3 years old children. If you have any questions about this product by Grocery House, contact us by completing and submitting the form below. If you are looking for a specif part number, please include it with your message.